This year’s remembrance will be especially poignant as we mark the centenary of the end of the First World War. In addition to remembrance events in Nuneaton, Bedworth, Bulkington, Ash Green, Exhall and Hawksbury village, special activities will take place across the Borough. In Bedworth there will be a poppy drop - in conjunction with the Royal British Legion, the Bedworth Armistice Day Committee (BADC) has arranged for poppies to fall from the air and drift down to the cenotaph Bedworth at 11 am; this event will enhance this special occasion, adding extra poignancy to mark the centenary. Town Crier Paul Gough will be attending the Remembrance Service in Nuneaton to proclaim the “Cry for Peace”; this will take place immediately after the laying of the Old Bill Boer War Memorial. Local groups across the Borough will also be participating in many individual activities. Parking on Council car parks throughout the Borough will be free of charge for Remembrance Day. “This year will be a special occasion as we mark the centenary of the end of World War 1. I hope once again that residents from across the Borough will be able to attend one of the special remembrance events on Sunday. 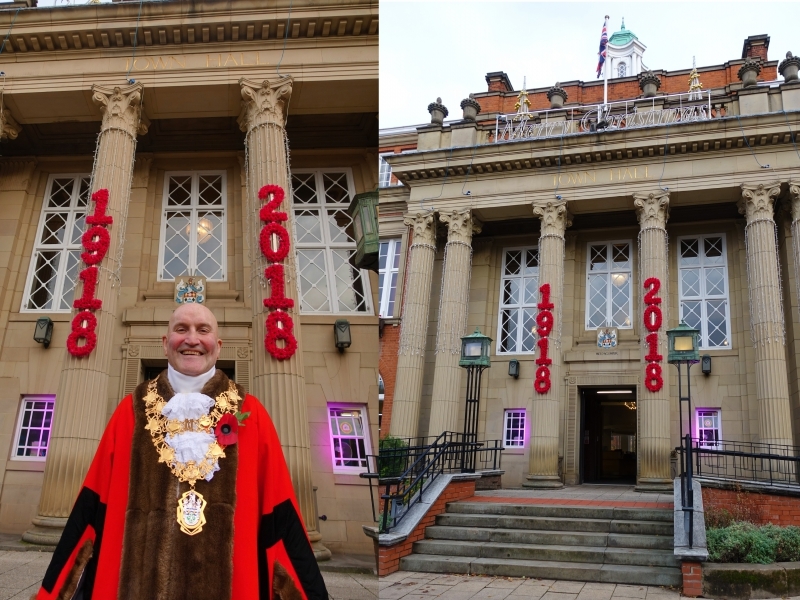 “I am delighted with the wreaths, they look fantastic displayed on the Town Hall pillars and make a fitting tribute to the veterans on this very special 100 year anniversary.